Egton Bridge, eight miles from Whitby in the North York Moors National Park, is the setting for the oldest surviving gooseberry show in the country, established in 1800. 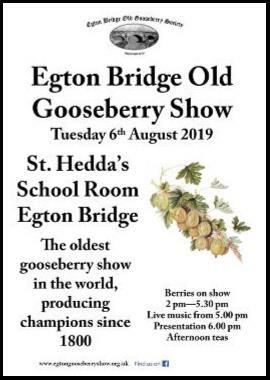 The show is held on the first Tuesday in August each year by the Egton Bridge Old Gooseberry Society. The 2009 show was truly a record breaking event. 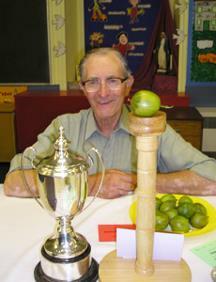 Champion grower Bryan Nellist took the R. Harland Challenge Cup with, at the time, a record breaking berry. Coming in at exactly 35 drams (2.19 oz. or 62.0 grams) the Woodpecker berry was the heaviest ever shown in the United Kingdom, beating Kelvin Archer’s previous record by just over 2 grains or 0.1 grams. It was recognised as an official World Record. Bryan’s success received widespread coverage in the local and national press. The Whitby Gazette hailed it as “Bryan’s berry best in world” (follow this link to see the full article, reproduced by kind permission of Whitby Gazette). Weather conditions this year have been challenging with the wet spring followed by the prolonged dry spell. 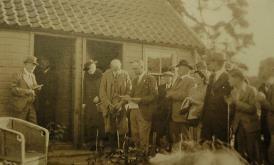 There were the usual tales of potential winners that burst and future record holders eaten by wasps. In the end, the turnout of berries was excellent, and competition was keenly fought. This year’s proceedings were also recorded by two visiting film crews, one from the BBC making a documentary following a year in a life of the North York Moors and a Chinese crew making a documentary called Legend of Fruits. 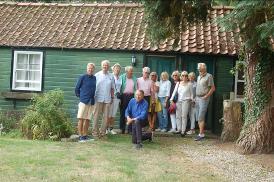 In addition, the show was graced by the presence of 12 members of the Skillinge Gooseberry Society from Sweden. Over 25 years ago their chairperson, Berit Åkesson saw a small glimpse of the show on the BBC and was so fascinated that a new gooseberry show was born and 2018 saw the Skillinge Krusbärsfestival celebrate its tenth anniversary with a visit to its inspiration. The 2018 show again saw some close competition but in the end the clear winner was the eight-time defending champion, Graeme Watson of Ainthorpe. Graeme became a nine-time champion, with six in a row, by winning the Harland Trophy for heaviest berry with a yellow Woodpecker weighing 32 drams, 21 grains (58g or just over 2 ounces). In the competition for the Champion Grower points are awarded for the first ten places in the six main categories, these being the four colours of single berries, twins and the heaviest twelve. Graeme achieved a near perfect score, missing a maximum by just a single point. 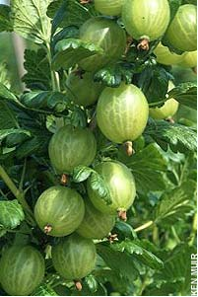 The elusive gooseberry maximum will remain unclaimed for another year. The 219th show will be held on Tuesday 6th August 2019 and it is open to the public from 2 PM. There will be music playing in the afternoon and the prize giving will begin at 6 PM. The Middlesbrough Evening Gazette proclaimed “Bryan smashes fruity record” (follow this link to see the full article, reproduced by kind permission of the Middlesbrough Evening Gazette). 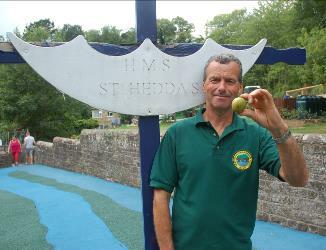 Kelvin Archer has subsequently reclaimed the World record but Bryan’s berry remains the heaviest ever entered into competition.